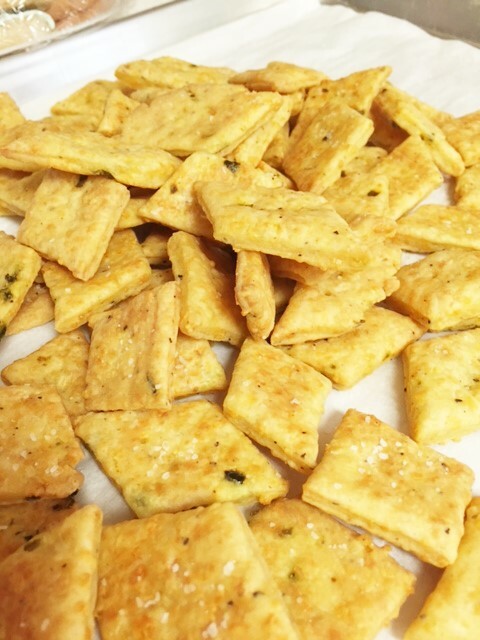 I love homemade crackers. They are delicious and addicting and oh boy do they go so well with wine! I mean, you don’t have to have them with wine, but they do go well together. You can make so many different kinds too. 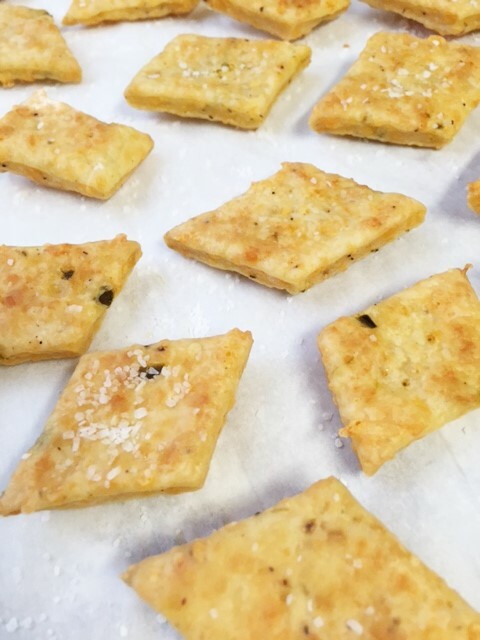 I made parmesan crackers awhile back and they were quite tasty. But the ones I made today are my favorites. 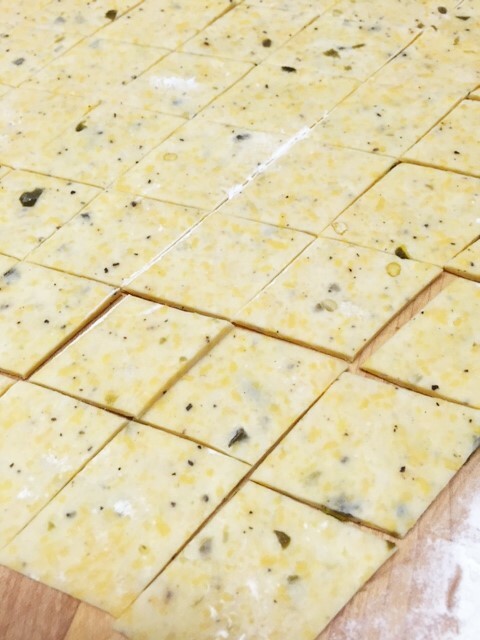 These are cheddar/jack cheese with jalapenos. MM-m-m-mmm, puffy little crunchy bites of YUM. They are so easy and quick to put together. They’re a great gift too! You could include a nice bag of these with a nice bottle of wine. Who wouldn’t want that as a gift?? You better make a lot though, they are addicting. 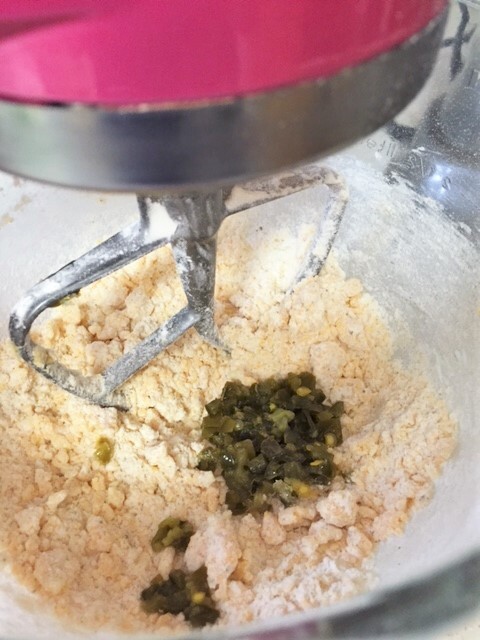 In a mixing bowl, using the paddle attachment, mix together the butter, cheese and spices. Gradually add the flour. Add the water and jalapeno. Mix until it all comes together. Wrap in plastic wrap and chill for 45 minutes. Preheat oven to 375. 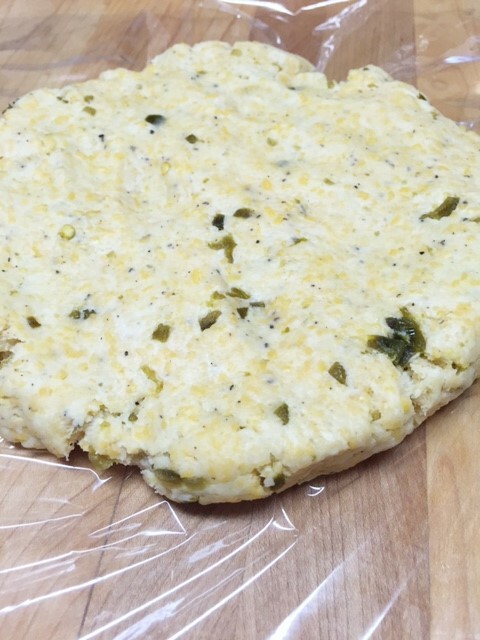 Roll dough out on a floured surface. Roll as thin as you can get it…….like, really thin. Cut into the shapes that you want. I used a pizza cutter and cut into strips and then across again. Triangles work too. Place shapes onto a parchment lined baking sheet. Use a fork and poke holes in each piece. Bake for 18 minutes. Don’t let them get overly browned. Remove from oven and allow to set out till cool. Don’t try to taste them right away. They will not seem crispy and they will have a flour taste. Allow them to completely cool. If at that time they still don’t seem crispy enough, put them back in the oven for another 3-4 minutes. Store in an air tight container, a nice tin, or in cellophane bags tied with some ribbon.